Keep your little ones entertained all vacation long with my Kauai baby and kids’ gear rentals. 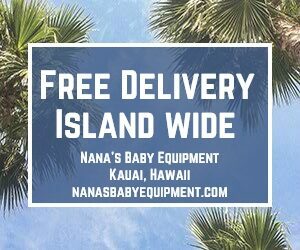 Whether you need a pack n play or full-size crib, a 3-in-1 rocker, feeder, and sleeper, or something fun for your keiki to play with in your hotel room or vacation rental, look to Nana’s Baby Equipment. My indoor rentals are extremely convenient in that you don’t have to pack and haul your child’s toys, sleeper, crib, cot, or high chair. These affordable, safe, and clean rentals include everything you need to enjoy your time on the gorgeous island of Kauai! And delivery is FREE island wide! Rent a stroller, folding wagon, or baby backpack to venture around the island with ease from my outdoor rental inventory. And Nana's has clean, safe car seats and will deliver them to the rental agency before your arrival! Don't forget about your comfort as well! Nana's Baby Equipment has you covered with several sun shelters to choose from, beach chairs to relax in, or a cooler for your favorite beverage. Do you have questions about any of my products? Fill out my easy-to-use online contact form, or call me at 808-634-3048. I will be more than happy to assist. Mahalo for your consideration, and enjoy your time on the beautiful island of Kauai. Some items do sell out during busy times of the year! If this is the case you will see the sold out dates on the item description. Please contact me prior to ordering car seats to ensure that I am available for delivery and pick up at your arrival and departure times. The car rental agencies on Kauai do not allow 'outside' car seats delivered to their office. Mahalo!